Really, what's to say about Sherlock Holmes that has not already been said!? I cannot add anything new or enlightening to any discussion about the character of Holmes or his creator. I'm pretty much just here to say that I recently read The Memoirs of Sherlock Holmes because I could and because I wanted to. Actually, I received a copy of this newly compiled collection of Holmes stories from Penguin Group. 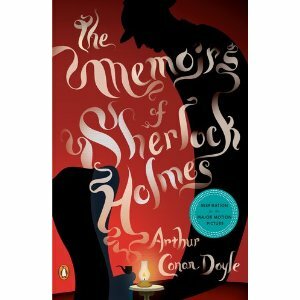 They've released The Memoirs of Sherlock Holmes alongside The Adventures of Sherlock Holmes (same style cover art, if you are interested in adding these books to your home collection and want them to match.) It just so happens that I was in the mood to read a mystery and had plucked a Holmes story off my bookshelf when I received an e-mail from Penguin asking if I was interested in reading this collection. Well, yes, by jove! I was! So it came, along with the Oregon rain. Sherlock Holmes in the rain. It just seems a bit too perfect. Back to my confession - I'm not very well-read when it comes to Doyle's works. I was glad to rectify the situation a bit. I enjoyed every single story. They satisfied my appetite for a fun mystery without freaking me out. (I hate being scared by stories - on film or in book form.) Holmes fit my Rainy Day Read bill and I'm quite delighted. Now I'll probably go back to watching him on screen again. 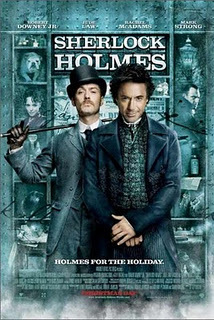 Speaking of movies and adaptations, there is a second Sherlock Holmes movie starring Robert Downey, Jr. which is coming out this Christmas. We saw the first one (linked to my thoughts) and didn't care for the storyline. Assuming this new one does not involve a cult, we might actually find more to enjoy about it. The dialogue was witty and that's a good selling point. If they'll just keep it clean and deal with truth accurately (possible?) I would greatly appreciate it. We won't be dashing off to the theater to see that one but if it receives some positive reviews we might catch it on DVD at some point. 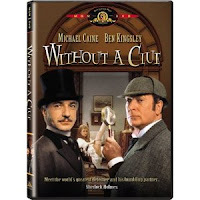 As I mentioned previously, one of my favorite Sherlock Holmes movies is Without a Clue , starring Michael Cane and Ben Knightly. This one is generally very clean although it does deal with the subject matter of a cross dresser. Avoiding spoilers, the cross dresser creeps in at the very tail end of the film. It's a minor detail to everything but it provides a parting thought which the more conservative viewer might wish not to be left with. Do you have a particular film adaptation of this famous detective that you rather enjoy? Any that I've listed above that you have strong feelings towards, in one form or fashion? Interested in reading some Holmes this fall and winter? Well, check out the new title from Penguin then! Until my next rainy day mystery read . . . Thank you to Penguin Group for sending me a copy of The Memoirs of Sherlock Holmes . I thoroughly enjoyed it! I was so excited when I opened my Google and your newest post popped up! I have been in love with Sherlock Holmes since I was eight and first read a gigantic compilation of 'The Adventures of Sherlock Holmes'. I will pretty much read or watch anything Sherlockian! The Laurie R. King novels based on the Memoirs of Mary Russel, the partner and wife to Sherlock Holmes. The Beekeepers Apprentice is the first book in that series. My dad loves the Jeremy Brett tv series the best. I actually did enjoy (for the most part) the Robert Downey Jr movie and am looking forward to the new one. The newest BBC series with Benedict Cumberbatch is by far my favorite. Doyle created a character that far out lived and out shown his own ideas for him. Sherlock Holmes is the only man I can think of that couldn't even be killed off by his own creator! I own, and read during my high school years, the complete Holmes. I don't think I could bring myself to watch the new movie, though. Why must they attempt to make every literary character and action hero? (See Around the World in 80 Days) Do the filmmakers REALLY think that the Holmes needs to throw punches and so forth to be interesting? Egad! Also as a comment, the use of a cult as a plot device is actually in the original Holmes novel, A Study in Scarlet, which depicted the Mormons in a very unfavorable light, causing controversy at the time. And, of course, Doyle himself became infatuated with the Spiritualists later in life. I loved A Study in Scarlet and The Sign of Four by Doyle! I have also read the Adventures of Sherlock Holmes, which I enjoyed, but I prefer the longer stories. I have one huge volume with all of Doyle's works in it, but I have not yet read The Memoirs. After reading this review, I think I shall! I like these mysteries, because I don't like to be scared by what I read, either; the stories are intriguing and suspenseful without being frightening. My biggest exposure to Holmes was in a radio series -- in one area where we lived, the Christian radio station played different old-time radio serials, and it was a lot of fun. I can't remember much to the plot of the Robert Downey, Jr., movie, but I did like his and Jude law/Watson's characters. I don't think I've ever read any of the books except maybe a brief excerpt in English class. I hear the BBC series is excellent! My students read Hound of the Baskervilles, and I really enjoy reliving it with them each year. 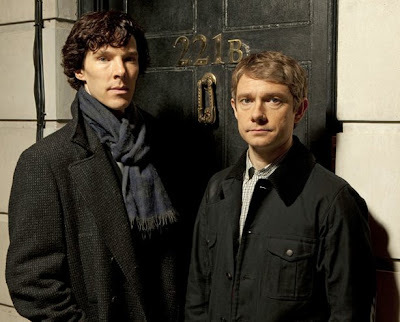 Did you know Doyle gave up Sherlock at one point (and wrote The Final Problem), and then brought him back? Interesting! I really enjoy reading Sherlock Holmes mysteries as well, and so does my 15yod. I don't think I've ever seen any screen adaptations. I tried to comment on this the other day, but some strange error message popped up. Anyway, glad you liked the modern version! The writers of it really are true to the story, as much as possible at least, and this shows up in delightful little moments (i.e., "It's a three-patch problem" instead of "It's a three-pipe problem"). I enjoy Sherlock Holmes but haven't read any in a very long time. We watched the new movie last year and were not impressed. Like you if the 2nd one comes across my path I'll watch it but I don't see us rushing to the theater for it.